Why Choose Testmasters For HSPT Preparation? One of the most sought-after HSPT preparation courses in the country, the Testmasters HSPT course was designed from scratch specifically for the HSPT Exam. Our material is thoroughly researched and developed by the Testmasters staff and kept up-to-date with the latest HSPT exam changes. The course is offered in a classroom setting or through private instruction, so you are sure to find a schedule that meets your needs. The quality of any course depends on the materials and the instructors involved. Most tutoring services and independent tutors provide general tutoring assistance but do not have any proprietary materials related to the HSPT nor do they really focus on strategies for test taking. Our courses incorporate all of these components and have engaging, highly-qualified instructors. Each instructor specializes in his or her subject area, and each course is typically taught by 3-4 instructors. View the HSPT course format. Testmasters has outstanding course materials.We base our course materials on real exams, including unique strategies and tips to help you excel on test day. The manuals undergo a rigorous development process with multiple revisions to make sure Testmasters students receive a top-notch product. 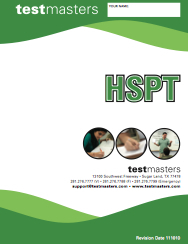 With hundreds of pages filled with sample questions and detailed explanations, the custom-designed manual forms the foundation for the Testmasters HSPT course from which our teachers draw out ideas to help students master the skills necessary to ace the HSPT. How Do I Register For a Testmasters HSPT Prep Course? You can register for a Testmasters HSPT Course online or you can call our office at (281) 276-7777 and register over the phone. For private tutoring contact our office directly and speak to an HSPT Coordinator or you may contact us online and we will contact you by the end of the next business day. Pricing is dependent on location.